If you want to improve your product’s documentation — or the whole user experience — there’s a tried and true technique: do a survey. At least that’s what we’ve always been told. Let me tell you a couple of stories. Earlier this week the British government, in the person of Science Minister Jo Johnson, announced that its new research vessel will not be christened Boaty McBoatface, even though that name won an Internet poll with 4 times as many votes as the runner-up. Evoking memories of Graham Chapman’s Colonel, Johnson declared that the winning name was simply too silly and that a more “suitable” name will be chosen instead. Much the same thing happened in 2006 when Stephen Colbert, in his Comedy Central days, encouraged his viewers to vote in an online contest to name a bridge in Hungary. Stephen Colbert Bridge won, garnering more votes than there are people in Hungary. Things hit a snag when Hungary’s ambassador to the U.S. good-naturedly informed Colbert that in order to be honored, he would need to be (a) fluent in Hungarian and (b) dead. Today the bridge is known as Megyeri Bridge because it connects two towns whose names end in -megyer. I’m not sure that’s better than Colbert Bridge. But I’m not Hungarian so I guess it’s none of my business. The moral of both stories? Surveys and polls can be entertaining. But their results aren’t always useful. Now I know that nobody is going to turn your customer survey into a prank. Still, when you ask your customers what they want, they don’t always know. Their responses likely will be knee-jerk, not reflective of careful thought. Want a better index? Sure, that sounds good. Bigger icons? Why not? Soon you’ve got a lot of “results” that you can turn into action plans. Yet you’ve missed the issues that truly affect the UX. The solution? Don’t ask your customers what they want. Instead, ask them how they actually use the product, and ask them what things give them trouble. Do they have difficulty finding the instructions they need? Are the instructions relevant to their work situations? Are there product features that go unused because they’re hard to set up and maintain? When you ask your customers how they really use your product, then you can use your own know-how to decide how best to make their lives easier. There’s an even better way, although it’s harder than administering a survey. If you can observe your customers at work, if you can see for yourself where they succeed and where they struggle, then you’ll know exactly where to focus your efforts at improving both the documentation and the rest of the product. Surveys that ask customers what they want: too silly. Surveys that measure the way customers actually use the product: much better. In-person observation (including usability tests): harder, but best of all. Tell me about experiences you’ve had improving your products by gathering information from your customers. This entry was posted in Technical communication, Value and tagged boat, Boaty McBoatface, bridge, poll, Stephen Colbert, survey, techical writing, usability, user experience, UX on April 20, 2016 by Larry Kunz. A lot of bloggers, including yours truly, have spilled a lot of ink (electrons?) pondering the question, What does the future hold for technical communication? meet, recently turned the question on its head. At her keynote address at the tcworld India conference last month, Sarah asserted that the future is technical communication — and then made a strong case for why that’s so. The summary of Sarah’s talk, and her accompanying slides, are two of the best things you’ll read all week. This entry was posted in Media and technology, Professionalism, Technical communication and tagged future, mission statement, Sarah Maddox, techical writing, Technical communication, technology on March 16, 2016 by Larry Kunz. I spent an enjoyable and productive Saturday afternoon at the STC Carolina chapter’s Student Resume Clinic. Several colleagues and I gave resume advice and conducted mock interviews with students from local colleges. This entry was posted in Professionalism, Technical communication, Value and tagged interview, job, resume, techical writing, Technical communication on February 25, 2016 by Larry Kunz. Are we driving or being driven? I looked at the cheat sheet: a 40-page Word file describing what works with what (and what doesn’t), the basic setup process, and several “gotchas” to watch out for. Good, useful stuff. Yeah, our customers would like to have this. I can massage it into a user guide. But when I investigated further, I found a surprise: about half of the cheat sheet consisted of content already in the product documentation. The CS guys were surprised when I pointed that out to them. So now we have two things going on: the organization has good information that it wants to deliver to its customers. At the same time we’re already delivering good information, but people don’t know it’s there. This entry was posted in Content strategy, Technical communication, Value and tagged Scriptorium, techical writing, Technical communication, trends on February 4, 2016 by Larry Kunz. I remember trying to do this in STC without getting too far. Now tekom, the European professional society, has taken a stab at defining the job duties of technical communicators. I think they’ve done a pretty good job. Start with the 7 areas of competence (pictured). 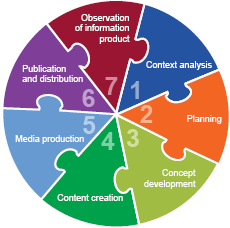 These aptly describe, in broad terms, the tasks associated with each stage of the content lifecycle. Then look at the 27 fields of competence. For example, Content Creation — one of the 7 areas of competence — breaks down into identifying information sources, acquiring and selecting information, using tools to create content, and so forth. You can see these 27 fields in the Profiling Tool, a self-assessment that anyone can take. All of this is a lot to digest. But by and large it reflects our jobs pretty well. In cases where I might quibble with the tekom definitions, it could be because I’m steeped in my own industry and tekom has tried to make the lists industry-agnostic. This entry was posted in Professionalism, Technical communication and tagged certification, competence, competency model, STC, techical writing, Technical communication, tekom on October 8, 2015 by Larry Kunz. Ethan Hunt, the hero of the Mission: Impossible movies, is pretty terrific. But he’s got nothing on you, the modern technical communicator. Ethan doesn’t flinch in the face of torture. You keep your cool in a room full of SMEs during a review meeting. Ethan deals easily with spies and assorted bad guys from all over the world. He speaks their languages and he knows their every nuance. You localize your content for the nuances of an international audience, and you work with translators calmly and professionally. Ethan is comfortable working under cover. You work out of the limelight, the project team sometimes totally unaware of the value you contribute. Ethan’s at his best when on the run, staying one step ahead as killers chase him around the world. You stay ahead of schedule as deadlines run toward you. And the really scary parts? Hanging on to the outside of airplanes and such? No more scary than when the project manager announces that two features have been cancelled and three new ones added — and the docs are still due next week. So next time you’re on a project that seems impossible, remember that you’re an action hero. Accept your mission and go change the world. Postscript: Do you know a good backronym I can use to rename my Tech Comm department to IMF? If so, please let me know. 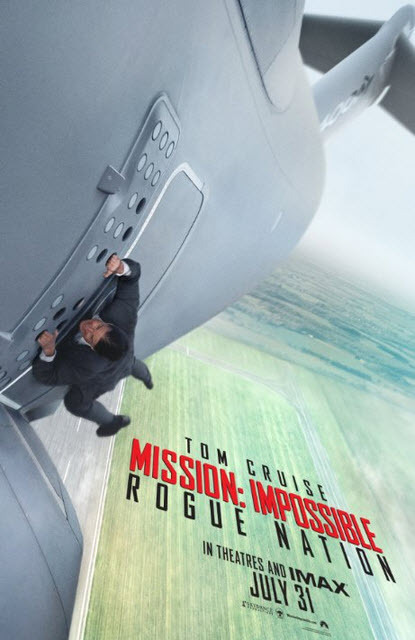 This entry was posted in Professionalism, Technical communication, Value and tagged Ethan Hunt, Mission: Impossible, spies, techical writing, Technical communication on August 4, 2015 by Larry Kunz.